This Zen however, was abruptly pierced by a long cry, causing many of the younger generation and disciples, who had been right in the middle of morning studies and sword drills, to tremble. Unable to help themselves, they looked for the source of the sound coming through the main gate. After that night in Dafan mountain, he had right away been taken away by Lan Wangji. He hadn’t had an opportunity to re-summon Wen Ning. He also didn’t have a chance to investigate why Wen Ning had lost his self awareness. Furthermore, he didn’t know how it was possible that he could reappear in this world. When he was a teenager, he had been sent to the Lan Clan with the rest of the clan’s children to study for three months. He had personal experience of Gusu’s Lan clan’s boring dull lives. Towards this clan and those more than 3000 densely engraved stone inscriptions of clan rules, regulations, and teachings he still had lingering trauma. Just now as he was dragged uphill, he passed by and saw a wall of engraved teachings. With numerous carvings in excess of 1000, now it had increased to over 4000. 4000! It was precisely because he didn’t want to enter Yun Shen Buzhi Chu that he had started making a racket! Once he was dragged in, it would certainly be difficult to leave again. Back then when he had come to study, each of the clan’s younger generation was issued a jade tablet pass. Carrying this item allowed them the freedom of being able to come and go as they pleased. Without this item they would be unable to pass through Yun Shen Buzhi Chu’s protective barrier. Over a decade later, the rules could only be more rigid. It was unlikely that they had become more permissive. Wei Wuxian embraced the small flower donkey, weeping even more broken-heartedly, knocking his head against the donkey. Too bitter! Originally he had believed that by allowing Zi Dian to strike him one time, that this would wash away any doubt. But this had made him become temporarily complacent. So he had found himself opening his mouth as usual for some frivolous affectionate teasing, and proceeded to blurt out that embarrassing sentence about Lan Wangji. How could he have known that Lan Wangji would not stick to his normal routine? What kind of justification was this? Is it possible for someone to change to such an extent? With such a high and vast cultivation, did his heart in turn instead become narrow and stunted? While he was still explaining, from within the main gate stepped out a few cultivators dressed in white. This man standing opposite of Lan Wangji was unexpectedly almost a mirror image. However, Lan Wangji’s eyes were extremely light, as pale as glass, while the other’s were dark, warm, and gentle. It was Gusu’s Lan clan’s master Lan Huan, Zewu jun Lan Xichen. The Lans of Gusu have their origin in this region. This clan has always been commonly known to produce beautiful men in large numbers. This generation’s perfect pair of siblings was especially noteworthy. Although not twins, these two brothers’ appearances were eight out of nine points similar. It was difficult to determine which was the superior of the two. However, while they had similar looks, their bearings were different. Lan Xichen was quiet, warm and refined, sincere and gentle. Lan Wangji was excessively cold, solemn, antisocial, and difficult to get close to. Therefore in the immortal family rankings for behavior and appearance, the former was number one while the latter was number two. Lan Xichen was worthy of his position as clan head. Seeing Wei Wuxian hugging the side of the donkey, he didn’t show any unnatural expressions. Wei Wuxian smiled from ear to ear and let go of the donkey to meet with him. The Lan’s of Gusu placed heavy emphasis on respecting seniority. All it would take was to speak a little rubbish at Lan Xichen and the Lan clansmen in Yun Shen Buzhi Chu would surely rise up against him. Who would have thought that exactly when he was about to fully display his capabilities, after a glance from Lan Wangji, he was suddenly unable to open his mouth. Unable to open his mouth, Wei Wuxian resentfully returned to the flower donkey’s side. Lian Fang zun, Jin Guangyao, currently holds the position of the clan head of Lanling’s Jin clan. He is Jin Guangshan’s only acknowledged illegitimate son and Jin Ling’s uncle. Jin Ling’s father, Jin Zixuan was his half brother. He also holds the identity of being Mo Xuanyu’s older half brother. Both were illegitimate children. However there was a world of difference in their treatment. Mo Xuanyu in the Mo clan village slept on cold tile and ate leftover food while Jin Guangyao sat in a cultivator’s highest position and wielded great magical power. Lan Xichen wanted to invite him to take part in a conference and to hold it as soon as possible. In any event, it was no wonder that the two clan heads of the Jin and Lan clans were very close personal friends, after all they had sworn brotherhood to each other. Happy? Wei Wuxian carefully examined Lan Wangji’s face. In what way does he look happy?! Wei Wuxian was then soon afterwards dragged into the place that he had sworn that he never in his life would set foot in again. Wei Wuxian was confused. Everyone looked at each other in dismay, not daring to make a sound. Within the Jing quarters, the layout was very simple. There weren’t any unnecessary things. A folding screen bearing a brushwork drawing of flowing clouds slowly drifted and fluctuated. A qin table was placed horizontally in front of the folding screen. Located in a corner was a three foot tall incense stand. A white jade fretwork incense burner gave off light spirals of smoke. The rooms were filled with the scent of sandalwood. Lan Wangji left to meet his uncle to discuss business while Wei Wuxian was pushed in. After Lan Wangji had walked away, Wei Wuxian then walked back out. He wandered a short distance in Yun Shen Buzhi Chu. However, just as expected, because he lacked a jade pass, even after crossing on top of the ten foot high white walls, he still promptly triggered the boundary alert and attracted the immediate interest of the individuals that were patrolling nearby. Wei Wuxian had no alternative but to return back to the Jing quarters. Having these thoughts, he couldn’t help but to approach the corner that held the incense burner. Coming closer, he noticed that one of the planks below his feet appeared to be distinctly different. Wei Wuxian, possessed by an odd feeling, began to knock about the area. In his past life, he had spent some time excavating tombs. Looking for tunnels was something he had done numerous times. Before long he unexpectedly was able to lift up a board. Within Lan Wangji’s room he had discovered a hidden cache. This matter alone was sufficient to startle Wei Wuxian. Seeing the things that lay inside, he became even more alarmed. After lifting the board, another aroma began to mingle with the sandalwood. He faintly became aware of the scent of alcohol pervading the air. Seven or eight plump black small earthen jugs crowded together in the small compartment. This Lan Wangji had really changed. He was even hiding liquor! Alcohol was banned in Yun Shen Buzhi Chu. Owing to this, the first time they had met, they ended up fighting. After a short bout, Lan Wangji ended up knocking him down but afterwards went down the mountain to Gusu and brought up a single jar of ‘Emperor’s Smile’. Returning to Yunmeng from Gusu, Wei Wuxian missed the opportunity to drink Gusu’s renowned ‘Emperor’s Smile’. He promised himself he would one day return to have a taste, only this day never came. He didn’t need to open a jar for a taste to know that this wine hidden here was ‘Emperor’s Smile’. It was hard to imagine that Lan Wangji, who was so scrupulous about following the rules and a person who never touched a drop of alcohol, that unexpectedly he would find he had excavated a hole in his room to conceal wine. Truly it was a good thing that heaven’s will had allowed him to reincarnate. Wei Wuxian sighed with deep emotion after having finished drinking one of the earthen jars. He had an excellent capacity for liquor. He also had a deep craving for wine. Feeling that Lan Wangji owed him a jar of Emperor’s Smile, after so many years he took the opportunity to collect on the interest and drank another jar. While drinking it up, suddenly there was a flash inspiration. Why was it so difficult to request a jade pass? Within the borders of Yun Shen Buzhi Chu there was a cold spring. It had many strange abilities. 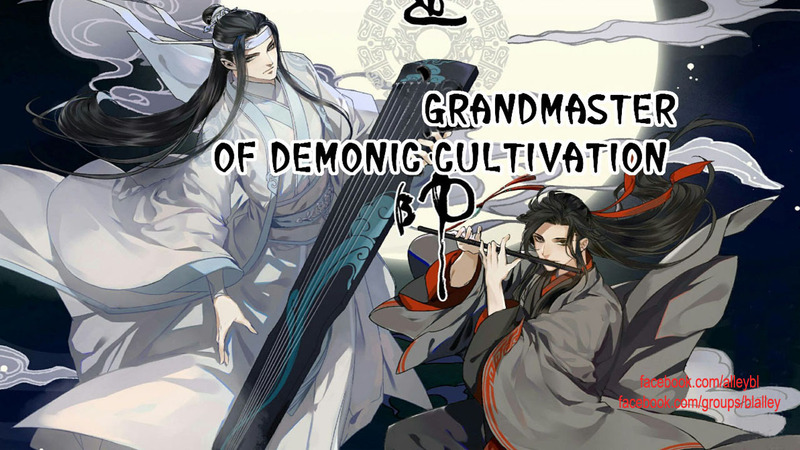 If used by clan’s younger male cultivators, it was reported to assist with clearing the mind for cultivation and had the wondrous effect of expelling evil internal fires. When using the cold spring, one was required to undress. With one’s clothes entirely removed, would they end up using their mouth to hold that piece of jade? Wei Wuxian clapped his hands. Drinking the final mouthful from the jar in his hand, he was unable to find anywhere to dispose of it. Finally he filled both jars with water, resealed them, returned them to their original locations, and covered it all back up with the board. His work complete, he immediately left to find a jade tablet. Although Yun Shen Buzhi Chu had burned down once ‘On the day he launched his attack’, after its reconstruction it was no different than before. Wei Wuxian used his memories to walk through the peaceful winding paths. Not long after he finally reached the place he sought. In a secluded location lay the cold spring. The disciple that guarded the spring was far away. The younger immortals assigned to this region of Yun Shen Buzhi Chu don’t come here to use it. Also, the Lan clan would never dare engage such kinds of shameless activity as spying upon people in the vicinity of the cold spring. Thus, the guards were light, easy to fool, and it was very convenient for Wei Wuxian to shamelessly approach. As it happens, on the fragrant thoroughwort (5) above the white rocks was a set of folded white clothes. Someone was already here. This set of white clothes was folded very neatly to the point of raising one’s hackles. It was as if they were a piece of snow white tofu. Even the forehead band was folded very meticulously. Wei Wuxian, who had stretched out his hand to rummage for the jade tablet almost didn’t have the heart to mess it all up. Crossing over clusters of fragrant thoroughwort, his eyes swept across the interior of the spring. Suddenly his gaze froze. The piercing ice-cold water of the cold spring, unlike a hot spring, didn’t emit any steam to cloud a persons eyes. Thus, coming from behind, it was possible to clearly see the upper body of anyone within the spring. The person within the spring appeared to be tall. He had pale skin and long wet jet black hair which was gathered to the side. The flowing contours of his lower back were graceful and powerful. To put it briefly, he was a true beauty. However, it wasn’t on account of coming across a beautiful person bathing that Wei Wuxian’s gaze had frozen in shock. Despite this person’s beauty, he truly didn’t like men. It was actually due to what was on this person’s back. This was what made him unable to look away. These marks were the kind that were left behind by a whip. Within immortal schools, this was a type of punishment that was used for those of the younger generation that had committed a major offense. After receiving this punishment, the scars never fade. Although Wei Wuxian had never been whipped, Jiang Cheng, however, had suffered such a thing. He had never been able to lessen the pain of that humiliation, thus Wei Wuxian was incapable of mistaking this kind of scarring. Usually, one or two lashes was sufficient for a serious lesson. It was enough for the punishment to be engraved in one’s memory for a lifetime, never to be repeated. This person carried no less than thirty lash marks on his back. It was unknown what type of serious crime he had committed to result in this sort of outcome. If it was truly such an unforgivable offense, then why had he not been immediately executed in order to cleanse the family? It was at this time that the person within the spring turned around. Beneath his collarbone, nearing the region of his heart, was a distinct brand. Seeing the brand, Wei Wuxian’s astonished feelings suddenly reached new heights. (1) 雅骚. I do a lot of my translating based on context clues. With titles like this, I have to just make a wild guess. If someone has a better suggestion, please let me know.